In 2019, New York City’s Metropolitan Transportation Authority (MTA) will start an 18‐month project to rehabilitate the L Train’s Canarsie Tunnel. To reach Manhattan during the tunnel closure, L Train passengers will have to rely on a multi‐seat subway ride and less efficient modes of transit (cars, buses, ferries, etc.). 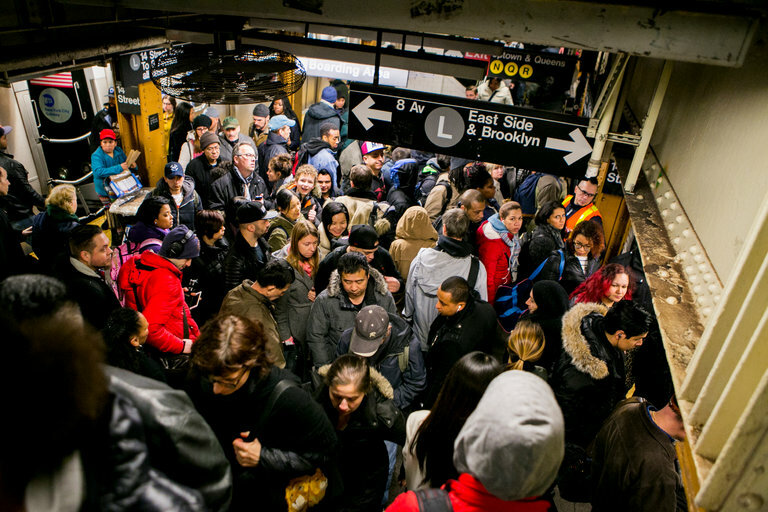 Relying on congested roads, limited waterfront access, and already over‐crowded subway lines will create a nightmare commuting scenario for the thousands of people who currently rely on the L Train’s one‐seat‐ride to Manhattan. An alternative approach is needed. ReThink Studio proposes a reconfiguration of E Train service that takes advantage of underutilized infrastructure and requires minimal new construction. Each day, 225,000 people use the L Train to travel across the East River. The Canarsie Tunnel, built over 100 years ago and now used by the L Train, is a critical mass transit connection for Manhattan and Brooklyn. 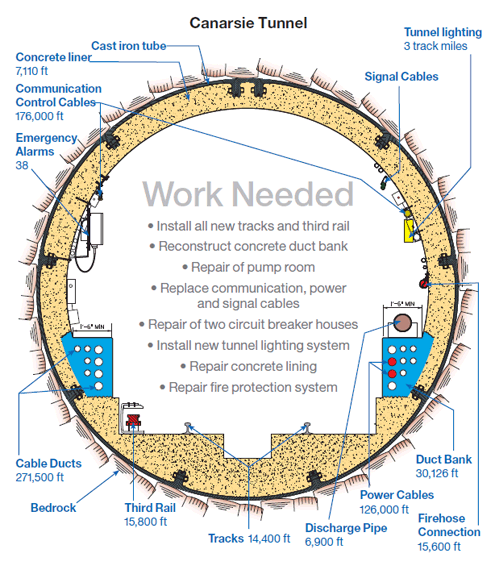 In 2012, Hurricane Sandy’s storm surge flooded the tunnel with seven‐million gallons of seawater, resulting in major service disruptions and significant structural damage. Facing the inevitable, the MTA must now make critical repairs to the Canarsie Tunnel. For an estimated year and a half, L Train riders will soon have to adapt to a complete shutdown of L Train service between Manhattan and Brooklyn. 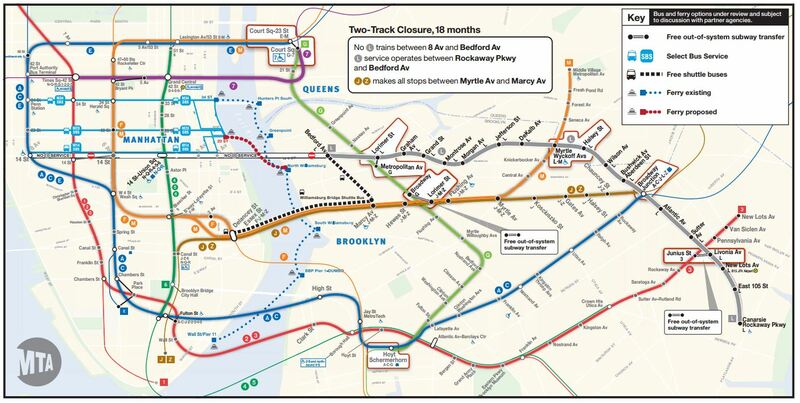 Though the MTA is finalizing their construction plan and adjusting nearby subway service to help alleviate the burden of the tunnel shutdown, none of the MTA’s proposed adjustments will be efficient and effective enough to accommodate all of the commuters who currently rely on the L Train to travel between Manhattan and Brooklyn. Additional cars will be added to trains on the G Line. J and Z Trains will make all stops between Myrtle Ave and Marcy Ave.
No L Trains will operate between 8th Ave and Bedford Ave. The L Train will continue to provide service between Bedford Ave and Rockaway Parkway. A shuttle bus service will operate from Bedford Ave to Delancey/Essex Street via the Williamsburg Bridge. A new ferry service may be provided from North Williamsburg to 20th Street in Manhattan. In 1925, NYC Mayor John Hylan proposed a subway line that would run in a loop between Manhattan, Queens, and Brooklyn. However, no track connection was ever built in Queens to allow for a subway route to operate circuitously between the three boroughs. As a result, the IND Crosstown Line (G Train) is presently the only subway line to not provide direct service to Manhattan. Drawing inspiration from Mayor Hylan’s plan, ReThink Studio proposes a semi‐looping E Train service to serve Brooklyn, Manhattan, and Queens. Instead of terminating at the World Trade Center, E Trains will continue along the A & C Line to Hoyt‐Schermerhorn Station (Brooklyn), where the E Line will branch off and continue north along the G Line to Court Square Station (Queens). With this new configuration, Brooklyn L Train passengers will have a two‐seat ride to Manhattan by transferring onto an E Train at the Lorimer Street‐Metropolitan Ave Station. Overlapping E & G Train service will also provide present G Train riders in Williamsburg and Bedford‐Stuyvesant with a single‐seat ride to Manhattan. 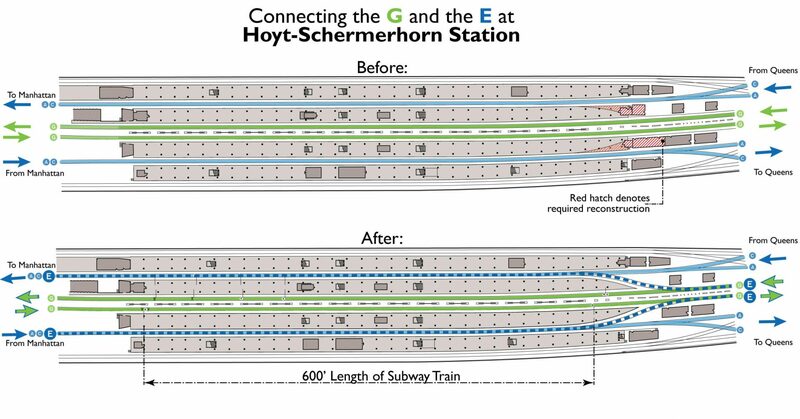 Extending the E Train will require the construction of two “Number‐6 track switches” on the eastern side of Hoyt‐Schermerhorn Station. The elevation of each track quickly changes before and after the Hoyt‐Schermerhorn platforms, so unused portions of two of the platforms will have to be modified to make switching between tracks possible. Since A, C and G Trains already converge at the same platform, the construction will be minimal. On the existing A and C Line, between Canal Street and Hoyt‐Schermerhorn, a bottleneck exists where four tracks merge into two tracks, limiting the number of trains‐per‐hour that can operate through this span of track. 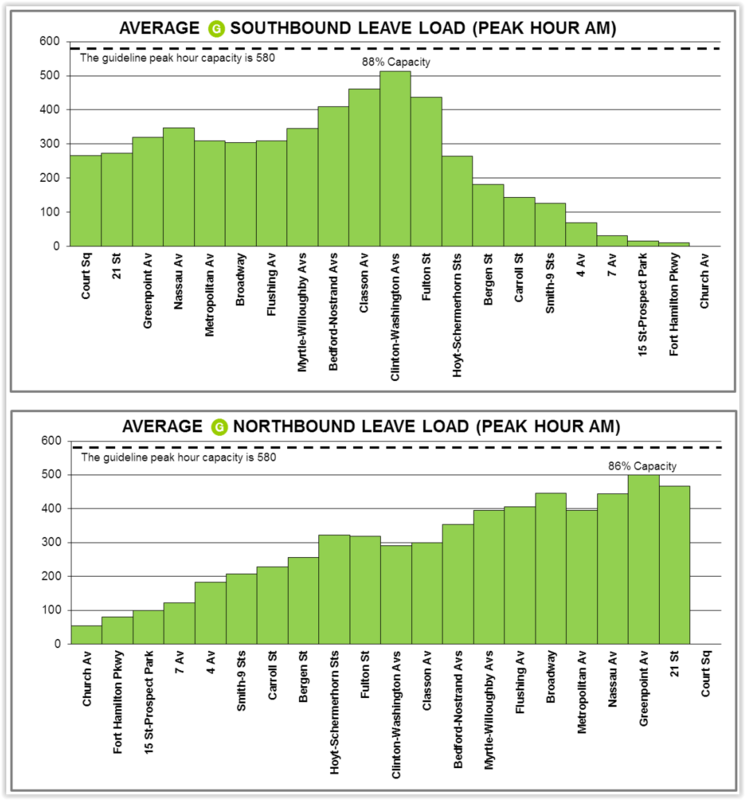 According to the MTA’s 2015 Review of the A and C Lines, the bottleneck reaches maximum capacity (23 trains‐per‐hour) only once during the morning rush hour. For all other times, ReThink Studio proposes that the E Train utilizes the remaining capacity. When this bottleneck is at capacity, the E Train will begin/terminate service at the World Trade Center. The MTA’s present plan involves adding capacity to the G Line by extending the length of the trains. However, the MTA will not increase the frequency of G Train service, meaning that riders will still have to wait up to 12 minutes for the next train to arrive. According to the MTA’s 2015 Review of the G Line, ridership on the G Train is highest between Court Square and Hoyt Street, and lowest between Hoyt Street and Church Avenue. Lengthening G Trains will help to accommodate displaced L Train riders using the G Line to transfer onto a Manhattan‐bound subway, but south of Hoyt Street, the G Train will have excessive capacity for a low amount of riders. The ReThink Studio proposal more efficiently uses the rolling stock by increasing service on the E Line in order to maintain frequent service when the line is extended to North Brooklyn and Long Island City. In addition, with E and G Trains operating together between Court Square and Hoyt‐Schermerhorn, this section of the route will have more frequent subway service. The 10‐car E Trains will provide Manhattan‐bound service, and the 4‐car G Trains will continue to operate on its present route (Court Square — Church Ave).